In other AppSource news, as of today Microsoft Teams apps are listed in, and installable from, AppSource, in addition to the Store inside Teams. Many are listed today, and the rest will appear over the next few weeks. Support for Adaptive Cards is coming soon to Developer Preview, integrated with bots, custom Connectors, and messaging extensions. Adaptive Cards will soon appear across many other Microsoft products, including Outlook, Windows, and Cortana. The platform team has been hard at work extending our support for Teams APIs in Microsoft Graph. By this summer, we’ll be releasing the current Teams Graph APIs from preview to general availability, including: create and deleting teams, adding members and owners, adding and removing channels, change team settings. New APIs for cloning a team (including its apps and tabs) and managing enterprise LOB apps via Graph will also be available on graph.microsoft.com/beta soon. Taken together, the first wave of Teams Graph APIs are ideal for automated provisioning of teams/users/channels and managing the lifecycle of these teams on an ongoing basis: one of the top requests from developers, partners, and customers. Another very common developer wish is APIs for reading the contents of messages in a channel, including threaded messages. We’re granting that wish with the Teams Messaging APIs for Microsoft Graph, which will also be available on graph.microsoft.com/beta soon. App packages in the cloud. The current version of App Studio stores its app packages locally, specific to a machine and to a specific client: if you use a different machine or move between the desktop and browser versions of Teams, you see different app packages. As of today, app packages will be stored in the cloud, associated with your Office 365 account, so you’ll see the same thing no matter where you use App Studio (that is, like everything else in Teams). Inline bot registration. 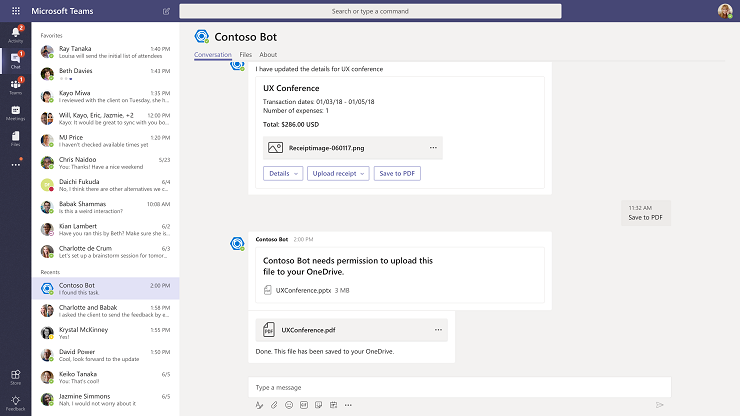 No more switching back and forth from the Bot Framework bot registration portal and remembering to activate the Microsoft Teams channel! This was one of the most error-prone steps in the Teams app development process, and it happened at the worst possible time: when a developer was first getting started. Soon, you can register your bot directly within App Studio, as well as update its messaging endpoint, something that bot developers do on a daily basis during the development process. 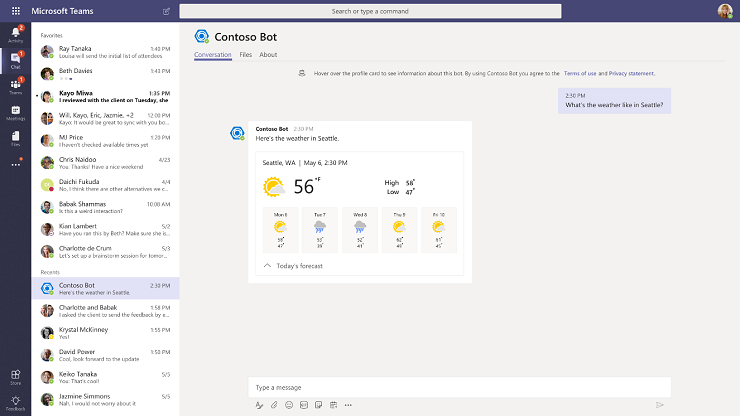 In Microsoft Teams today, users can interact with apps in a channel or individually. Except for a few limited cases, you can’t add tabs to a group chat, and you can’t use bots or messaging extensions in group chats. Soon, this will the ability to use apps in group chats will be available in Developer Preview, and you’ll be able to use Teams apps everywhere. At Build today and throughout the week, you’ll learn more about these enhancements to the Microsoft Teams developer platform…and more, including features that are a little further out. 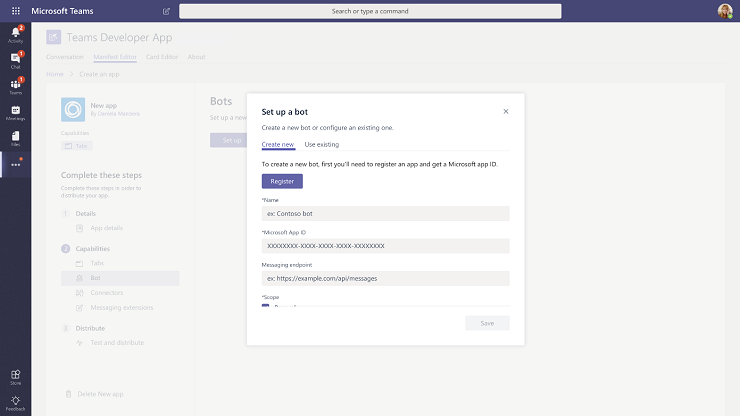 In particular, we are excited to announce the first step on the journey towards apps tailored for your enterprise with the Microsoft Teams LOB app store. We invite you to check out the Build 2018 videos on Channel 9, including the sessions we pre-recorded over the past few weeks.